I am a pretty slow reader. Whenever I gain speed I fear that I leave out some vital information, re-read the part and have gained none speed whatsoever. So I just take my time. Of course that didn't stop me reading 1000+ pages books. Interestingly enough, those books are still regarded highly as very good reads. Novels like Stephen King's It, The Stand, and especially Frank Schätzing's Der Schwarm (The Swarm), all around the 1000 mark, just grabbed me and made me run to my bed every free second I had to continue reading. Not much of a science fiction reader, so I cannot comment on your mentioned series. But those books can grab you and it's understandable that one does not get tired of reading them. I had a similar experience with Stephen King's Dark Tower series. Simon wrote: I am a pretty slow reader. Whenever I gain speed I fear that I leave out some vital information, re-read the part and have gained none speed whatsoever. So I just take my time. Of course that didn't stop me reading 1000+ pages books. Interestingly enough, those books are still regarded highly as very good reads. Novels like Stephen King's It, The Stand, and especially Frank Schätzing's Der Schwarm (The Swarm), all around the 1000 mark, just grabbed me and made me run to my bed every free second I had to continue reading. It depends on so much if I'm a slow reader. Most importantly how I feel, and if I like the book or not. I miss my little dog who was pretty much by my side, or feet as I read. I'm not into sci fiction much at all, mainly because I don't come across those type of books. It is a popular genre locally, I'm just not quick enough in buying them. I think if there's a type of book I don't read, is the gory type. I have books yet to be read based on true crime, but it will take quite something for me to be able to delve into those. Simon wrote: After the rather light-hearted read of a Grisham novel and the 50 Shades of Grey annoyance I think it was time to have some highbrow read. I looked at the unread books in my apartment and decided to give Siri Hustvedt's latest novel, The Blazing World, a try. Quite fitting, because after Fifty Shades of Grey, which advertises women being submissive, Hustvedt's novel is a feminist novel par exellence. It is about the fictional artist Harriet Burden who accuses the art world being mysogynistic. After her art is never really praised and articles about her exhibitions are more focussing on her famous husband, a succesful and influential art dealer, she tries an experiment: She creates three exhibitions but lets the art world think that men are the artists. After all exhibitions prove to be succesful, Burden reveals her plot and the art world has something to explain. The novel has a nice way of presenting the life of Harriet Burden. Rather than a simple novel structure, Hustvedt offers her novel as a scholarly monograph being edited by an art researcher (whose gender is never disclosed). Starting with a preface that introduces the reader to the background, each chapter offers different pieces of information about Burden (who has died a couple of years before the book) by offering interviews with people close to Burden, written statements by family members, newspaper articles and so forth. Even though it feels quite chaotic at first, Hustvedt always offers one important piece of information that somehow explains something from the previous chapters. Since each chapter is written from a different perspective, the novel always changes rythmn, language, style and keeps you reading. The scholarly chapters are a bit annoying if you aren't well versed in psychology, philosophy and art history. I certainly know almost nobody Hustvedt (or the art reseacher as it was) mentions there. And if I do, I don't know enough about there work to instantly see the connection. Hence, it feels a little bit too constructed and pseudo-intellectual. As if she wants to show off how much she knows. But those chapters are important as well. And any other chapter is all the more easily accessible. So, if you are interested in feminism, the art world, novels with clever structures and authors with about 500% increased vocabularly in comparison to E L James, this one is for you. Not my favourite Hustvedt-novel, I still prefer What I Loved, which is also about the art world, has a more conventional structure but it grabbed me more. I had the book in mind today while shopping. I didn't see The Blazing World, but I did see Swan Thieves, by Elizabeth Kostova, so I snapped it up. The Heart Is A Lonely Hunter...enthralling book, but the ending I didn't like so much. I feel there should've been much more in tying up loose ends. Simon, did you ever read The Fault In Our Stars? Asking because you mentioned the book in here. icy wrote: Simon, did you ever read The Fault In Our Stars? Asking because you mentioned the book in here. No, I wanted to borrow it from a friend, but she only has the German translation. Not that I am depressed right now but I don't think I need a sad book right now. But I will read it soon enough and afterwards watch the film (which was praised highly by many cherished friends and newspapers). Did you read it? Is it as sad as people claim? I will start reading it next week, when I'm done my current book. I was going to ask you if it was sad/depressing/hopeful/bittersweet if you had read it. I am not an emotional person, but the friend of mine said that she cried a lot while reading the book. But it seems to be a good mixture... it is funny too, but the premise of the book should tell you that it is not a happy read throughout. I don't expect it to be a happy read, but except for the synopsis, I don't know what to expect. Anyone know any decent fantasy stories out there? I've already read Tolkien's stuff, David Eddings' Belgariad, Malloeron and the Sparhawk series, Stephen Donaldson's Thomas Covenant books, Raymond E. Feist's riftwar saga, but there doesn't seem to be much out there that's refreshing and new. I dabbled with Terry Goodkind's Magician's First Rule, which was entertaining, but it also throws up some of Goodkind's personal worldviews, which are more than a little unsavoury. I'd like to get my teeth into another epic fantasy, but don't know here to start. Anyone have any ideas? Tarkus wrote: Anyone know any decent fantasy stories out there? I've already read Tolkien's stuff, David Eddings' Belgariad, Malloeron and the Sparhawk series, Stephen Donaldson's Thomas Covenant books, Raymond E. Feist's riftwar saga, but there doesn't seem to be much out there that's refreshing and new. I dabbled with Terry Goodkind's Magician's First Rule, which was entertaining, but it also throws up some of Goodkind's personal worldviews, which are more than a little unsavoury. I'd like to get my teeth into another epic fantasy, but don't know here to start. Anyone have any ideas? I think I already mentioned it in this thread, but I'm a big of fan of that DragonLance series by (or started by, at least!) Weis and Hickman (which is definitely Tolkien-influenced, btw)....I don't know if it could be called refreshing and new, but I think it's pretty good stuff. The Chronicles and the Legends trilogies by them are classics IMO....there's also a ridiculous amount of books by authors set in the same universe, some of which are pretty good. Back in the days when I used to spend a lot of time in various chat rooms, I always wanted to use a name of a character from that series, but they always seemed to be taken! 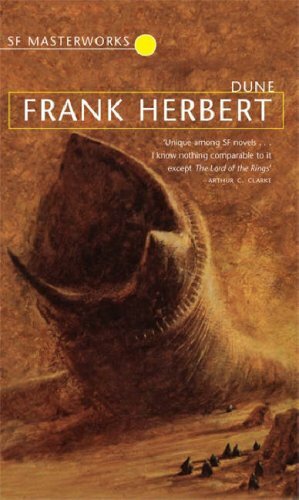 I remember when I was on a spontaneous trip to Montreux with my mother, I was reading Frank Herbert's Dune and was completely immersed in the story. I knew about the story of Dune because of the computer game which I also loved. A couple of years ago I bought a hardcover edition because I wanted to read it again. But then I couldn't find the thrill I had about the story years ago. Nevertheless, it IS a great fantasy novel. But I guess you already read it? (Cannot speak about the sequels of the original novel. I too loved Dragonlance growing up. Chronicles/Legends - but they aren't really epic. Fun and easy reads though. If you want real EPIC fantasy go with Robert Jordan's Wheel of Time or my new favorite read Brandon Sanderson. Sanderson falls down the stairs and finishes 2 books on the way down - he's that prolific. He's 2 books into his truly epic 10 book series - The Stormlight Archive. AND beyond that he's actually even more ambitious. (Almost) all of his books take place in the same universe (the Cosmere) but you don't have to read everything to get it - but it's a nice added bit. Sanderson also is the one who finished Jordan's Wheel of Time based on Jordan's notes when Jordan passed away.